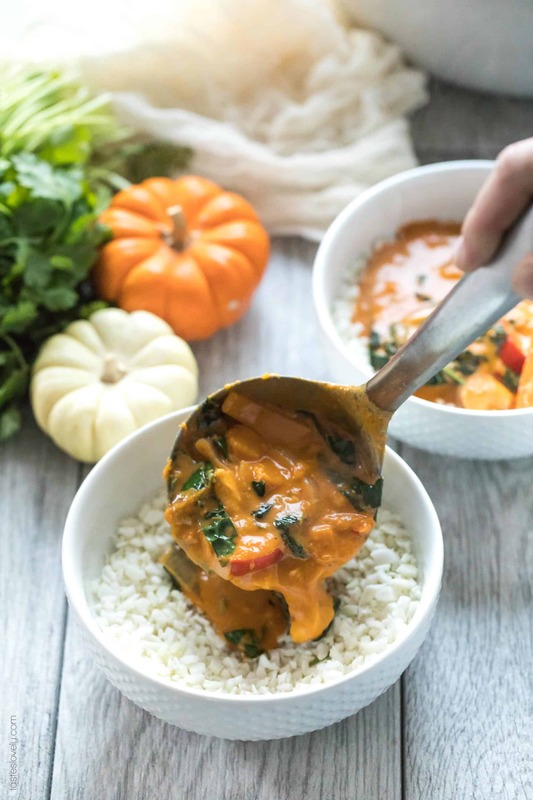 Paleo & Whole30 Pumpkin Coconut Thai Curry – a flavorful and healthy dinner recipe! 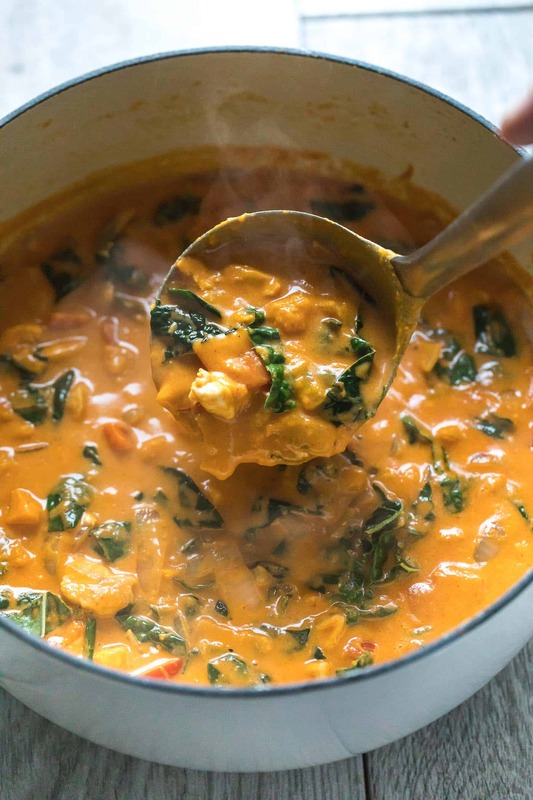 Packed with pumpkin, kabocha squash and kale. Gluten free, grain free, dairy free, sugar free, clean eating. 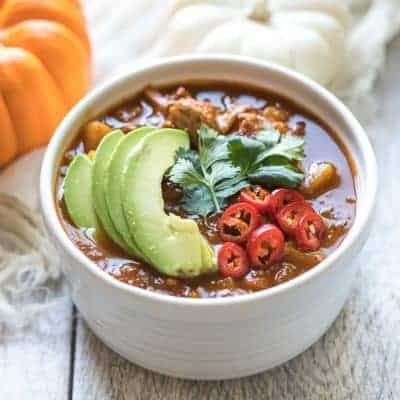 I’ve must squeeze in 1 more pumpkin recipe before October is over. And this might be my favorite one yet. 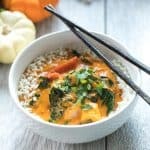 Paleo & Whole30 Pumpkin Coconut Thai Curry! I’m sure many of you have already made my Paleo & Whole30 Coconut Chicken Thai Curry. That recipe is consistently one of the top 5 most popular recipes on my blog month after month. Head over and read all the rave review comments from readers who have made this. It’s a huge hit! I’ve tweaked the vegetables in the recipe a bit to make this even more fall friendly, adding in pumpkin puree and kabocha squash. I think I like this version even more than the original! 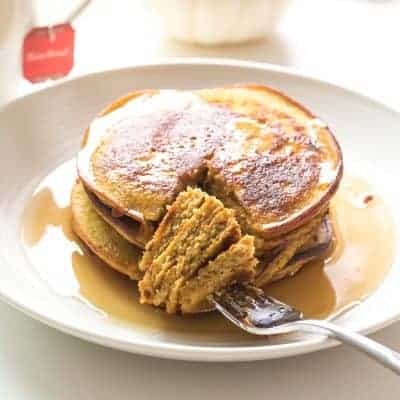 Have you eaten kabocha squash yet? It’s also called Japanese pumpkin. I am obsessed with it! It tastes like a pumpkin crossed with a sweet potato. Amazing fall vegetable. It can be a bit of a pain to peel and chop, but luckily Trader Joe’s has Organic Peeled and Chopped Kabocha Squash in the freezer section. (Not sponsored, I just really love this stuff). Makes this recipe come together in a snap! If you can’t source kabocha squash, butternut squash would make a great substitute. I start off by browning the chicken. I then sautee the onions and bell peppers until they’re soft, then add in the frozen kabocha squash, ginger and garlic, pumpkin puree, coconut cream and red thai curry paste. This is my very favorite red thai curry paste, and all the ingredients are paleo and Whole30 approved! I use just 2 tablespoons of the red thai curry paste, I like my curry mild spicy and I don’t want it too spicy for the toddler to eat. But feel free to add more curry paste for stronger flavor, and red pepper flakes for spice. My husband tops his with a very generous sprinkling of red pepper flakes because he likes his curry spicy. After the curry has simmered and all the vegetables are softened, I add the chicken back in and the kale leaves. I’ll simmer it for another 5 minutes more and then it’s ready to be served. 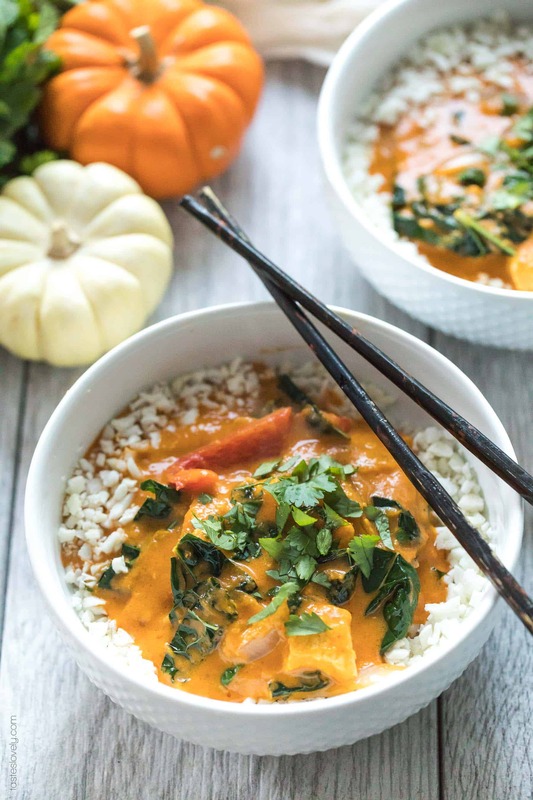 I serve this Paleo & Whole30 Pumpkin Coconut Thai Curry over cauliflower rice. 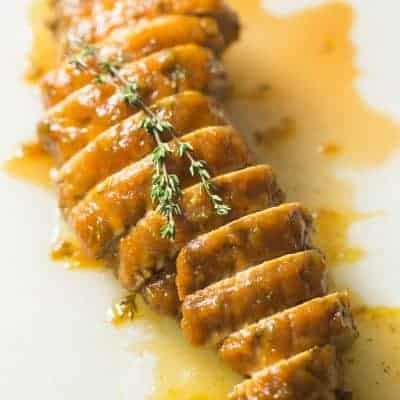 You could also serve it over zucchini noodles, butternut squash noodles, sweet potato noodles or a roasted sweet potato. To garnish it I like mine topped with chopped cilantro leaves. My husband likes his with a bunch of red pepper flakes. This curry keeps beautifully, and sometimes I almost like it better the second day. It freezes beautifully too! I’ll often make a double batch, serve half for dinner and leftovers that week, and freeze the second half. I keep mine frozen in freezer safe ziploc bags. 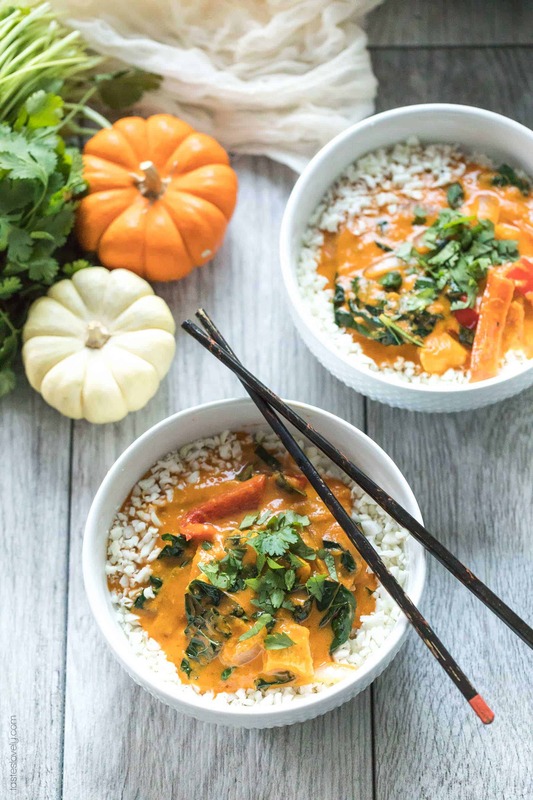 You and your family are going to love this Paleo & Whole30 Pumpkin Coconut Thai curry. Full of flavor and healthy vegetables. 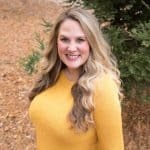 It is paleo friendly, whole30 approved, gluten free, grain free, dairy free, sugar free and clean eating. In a dutch oven or wok over medium high heat, add 1 tablespoon coconut oil. Cook the chicken until golden brown, turning occasionally. About 8 minutes. Transfer to a plate. In the same dutch oven over medium high heat, add another 1 tablespoon coconut oil. Cook the bell pepper and onion and season with salt and pepper. Cook the vegetables until starting to brown slightly on the edges, but still crisp tender, about 6-8 minutes, stirring occasionally. Add the kabocha squash, garlic and ginger, cook for 30 seconds until fragrant. 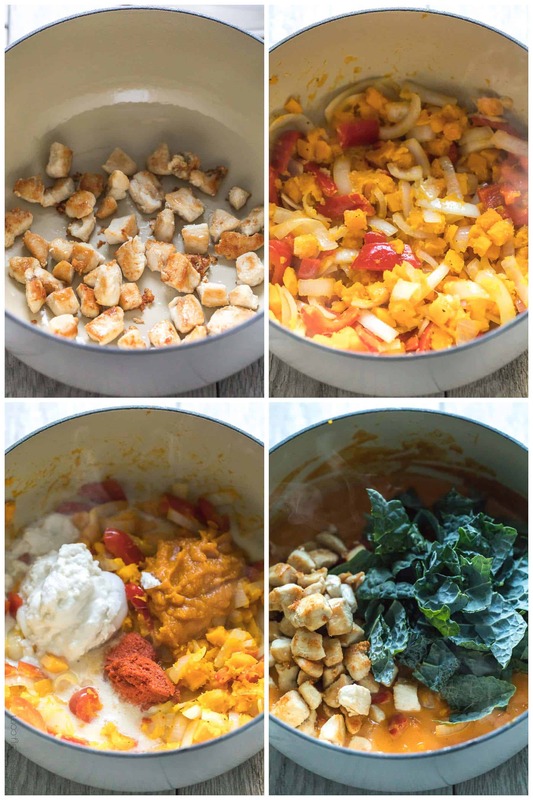 Add thai curry paste, pumpkin puree and coconut cream and stir to combine. Simmer until the vegetables are tender. Add the chicken back in, and the kale and cook for another few minutes until heated thru. Serve warm over cauliflower rice, and topped with red pepper flakes and chopped cilantro.